Sometimes it takes me a little while to work up the nerve to tackle a watch. For example, I have had a chronograph sitting on my bench for over a year waiting for me to take it apart and see if I can put it back together again. It's not a complete watch and it isn't working so it's really just for my own personal edification. Even though I have nothing to lose, it's still a daunting challenge to undertake. Another watch that has been patiently waiting it's turn at the spa is a 1975 Auto Date Chadwick. I've had this watch sitting on my bench looking at me for at least seven months. I know it's going to be a challenge because it's a day & date self winding model and that means there are a lot of extra parts inside to handle. 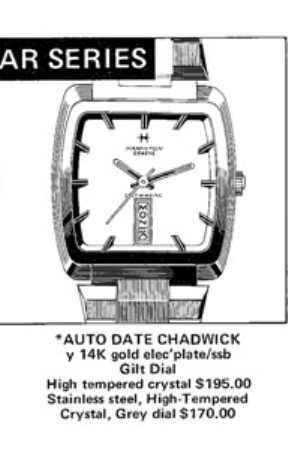 The Auto Date Chadwick was produced for at least three years. It's big and chunky and came in yellow gold electroplate or stainless steel. The model number is 826017 and -4 at the end is the yellow version and -3 is the stainless steel version. Regardless of version, tucked inside is a 17 jewel Hamilton 826 movement which is based on an ETA 2798 calibre. My project watch is in fair condition. The crystal has some scratches and the case has obviously seen some use but the only significant sign of wear is the crown is worn smooth on the outer surface. I haven't detailed an 826 movement on the blog yet so I took a lot of pictures. I'll put this post in the "Overhaul Examples" link on the right side of the screen along with all of the other movements I've tackled. The detailed pictures will also help me figure out how to put the movement back together again once it's been cleaned. The stainless steel back design is a new style for me. Four large screws secure it to the electroplated bezel. It's hard to get the camera to pick up the engraving on the back but it says Hamilton and the model number. It might become more legible once I buff the case and get rid of the myriad scratches. With the back out of the way, the movement appears to be held inside a movement ring that is sandwiched between the case back and the front bezel. It's frozen solid so I'll have to think about how to get it out without damaging something. First I'll apply a little penetrating oil to the seam and see if that frees things up. There's a large o-ring inside the back to keep the movement sealed from the elements. I don't see any service marks inside. I wonder if I'm the first person to overhaul this movement in the last 40+ years? Sure looks like it based on what I've seen so far. A tap-tap here and a tap-tap there. Eventually I work the movement ring out. Turns out pushing on the crystal from the front helped to push the assembled works out the back. According to the catalog the crystal is high tempered something... is it glass or plastic. Looks pretty plastic to me so I'll try buffing it and if the scratches come out then it's plastic. You can't buff out scratches from glass. Two case screws held the movement to the movement ring. As you can see, this is a three-piece case... a front, a back, and a middle sandwiched in between the front and back. With the dial out of the way you can see the business end of the day and date complication. It takes two weeks for the middle day ring to make a full rotation. The day wheel is sitting on top of a ring that centers it on the main plate. The hour wheel is under that ring so when I lift up the golden hour wheel in the center, the day wheel will lift off with it. This is starting to look familiar.... most of the calendar models have a similar setup but the extra parts needed to make the day wheel move are located on the right side. I'll start pulling off parts one by one until I can get the date wheel to lift off. First off is the little starfish-looking wheel between 2 and 3 on date ring (above). This wheel advances the day when the quick-set mode is activated during setting. Next off is the index lever up by the 11 & 12. This lever centers the day in the day window of the dial. There's a little spring held in place next to it. That comes off next. The spring is removed by pulling one of the two set bridge screws. Removing the other set bridge screw will provide access to the rest of the setting parts. Now's a good time to take a shot of the parts and the screws I've removed so far, in case I get them mixed up. Half way there... now I can lift off the date ring. In order to get the cannon pinion off I will need to remove the parts on the left side of the movement. I go into my light tent to take the other parts off. There's a spring inside that is know to fly off and it's good to keep the possibility of it being lost to a minimum by enclosing this part of the effort in a 3 foot by 3 foot white tent. With all the parts off the front I can now work on the back. The movement is very similar in design to Hamilton's modern movements. The main difference is most modern Hamiltons have a higher beat rate - but the construction of the movements are very similar. One screw holds the oscillating weight onto the framework beneath. Two blue-colored screws hold the framework to the movement. The movement at this point looks like a typical manual-winding ETA movement. I'll make sure the mainspring is released and then pull the barrel bridge to get access to the barrel underneath. Now I can pull the two screws that hold the train bridge in place. That provides access to the four train wheels and I can remove them next. Before I take off the balance assembly, I'll open the shock spring and remove the balance jewels inside. I close the spring and now I can pull the balance bridge and balance off. The pallet fork is removed and now the main plate is almost free of parts. I flipped the movement over and removed the balance jewels from the other side. Now the movement can go into the cleaner. Man there are a lot of parts to this watch! Everything is cleaned and dried. Putting the movement back together is almost the opposite of taking it apart. In the shot below, the basic movement is back to running condition and ticking away with a brisk motion. This movement has a 21,600 beat per hour beat rate - considerably faster than the 18,000 BPH rate that most vintage watches have. Running a little fast but I can fine tune everything with some minor tweaking. How's that for right on the money? Turning my attention to the front of the movement, the only really tricky part of reassembly is to position the day wheel so that it will index properly. First is to put the hour wheel in place and next is to line up two little detents on the silver day wheel ring with corresponding holes on the main plate. That centers the ring and the ring centers the day wheel. I will stick a small screwdriver near the 23 number to move the index lever out so the day wheel seats properly. Two spacers go onto the outer circumference of the main plate and keep the dial from rubbing the date ring. Before I put the dial back on I need to make sure I put the dial washer on top of the day wheel. That will help the dial keep the day wheel pushed down against the main plate. Now the dial can go back on the dial feet secured by pushing the two spring levers in to hold the dial feet tight. I advanced the time until the day and date changed, then installed the hands at 12:00 - indicating midnight. Notice how the dial has a ghosted mark of the chapter ring that goes on top of it. The movement goes into the movement ring and the chapter ring goes on top of the dial. There's no six marker on the chapter ring so that makes it easy to know what side goes where. The two case screws secure the movement to the movement ring and the assembly can go back into the case. The outside of the crown is well worn. You can see it has an H logo but the crown looks like crap compared to the rest of the watch now. ... but it won't fit onto the stem tube. Changing crowns is a surprisingly complicated challenge. There are a lot of dimensions and attributes to consider. One of the dimensions is the outer diameter of the crown. The original is 4.5mm. I'll use a 4.5mm generic waterproof crown with a 2mm tube opening and a tap 10 thread. With a huge sigh of relief I install a 20mm strap and take the completed watch to the light tent for it's pillow shot. I have to admit that this watch really turned out great. It was not as easy as the details above might make it out to be. In fact, when I cleaned the dial the finish on the dial turned an opaque milky white... Argh! I think it may have had something to do with the penetrating oil I used at the start. It took some doing but I was able to remove the milky appearance and I treated the dial to a light application of lacquer. It was a miraculous recovery. It's a pretty sharp-looking watch, which is saying something for a 1975 model. That said, I don't think I'm terribly excited by the prospect of doing another day and date model. Fortunately they were introduced in the 1970's so my focus on pre-1969 models will keep me free of these beasts for a while. The new crown doesn't have an H logo but otherwise it's a perfect fit. Dan. I may be making headway. Had a watch with a 982 that seems to have problems with the hairspring. I successfully swapped the movement from the donor watch, cleaned the dial and did not destroy anything. Now for the fun part. I took the balance out of the 982 and untangled the hairspring. Removed the bridge? with the wheels above it. having a time aligning the gears. But I think I will eventually get it. After reading a couple books on hobby watch repair, this is no easy task. In addition to spending hours looking at your posts. Gee, if I would have studied this hard in college I would probably a retired millionaire by now! I found a couple of 982 movements on ebay. So I can hopefully get the donor working again. Can you put a 980 movement into a 982 watch? As always enjoyed your post on the automatic. I just do not ever see the 70s style being classic. Kind of like my 1974 class picture in a leisure, white belt and stacked shoes. Wide lapel and all. I foresee a broken escape wheel pivot in your near future. Yes, a 980 and 982 are the same physical size and are interchangeable. Sounds like you were quite the looker in 1974. Uglier than a muddy white picket fence! The broken escape wheel pivot may already be in the works!